Yes I see the images in the cache folder but when the net is off the images don't show until I put on the net again. So seem not fetching from cache. Don't forget the Thank User button if i have helped! (2015-10-02, 00:24)Rjsachse Wrote: Yes I see the images in the cache folder but when the net is off the images don't show until I put on the net again. So seem not fetching from cache. Can you try latest Git ? I've added some code to make sure the Kodi texture is used. Is it possible to have the colour swatches that are included with the skin be copied to addon folder also? (2015-10-01, 21:29)marcelveldt Wrote: OK, that means that my little trick to convert the time/date is failing. I wanted it to return the localized time. Get you grab the latest version from Git ? That one should return the time from json response as fallback. It will also print in your Kodi log why it failed to convert the time. Can you share the error with me please ? I needed the error why it was failing to convert the date. I will look into it right away. EDIT: I checked in a small change. Could you please try if this fixes the issue ? The copying seems to be working great. Thanks. 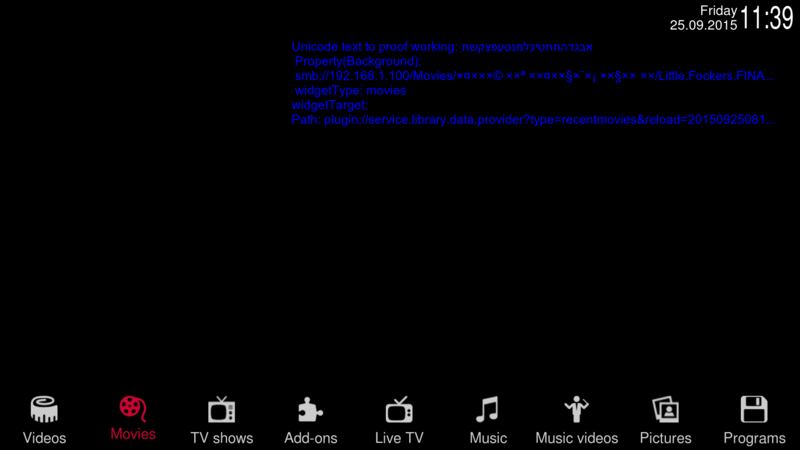 As long as that's working I'm not too concerned about Android, because the PIL issue seems limited to FireTV. As far as I can tell, it seems that the manual colour swatch generation is only happening through the normal colour picker method, and not for the skinshortcuts property setting method. (2015-10-02, 10:18)jurialmunkey Wrote: As far as I can tell, it seems that the manual colour swatch generation is only happening through the normal colour picker method, and not for the skinshortcuts property setting method. Properties are correctly returned with correct time / date format. All channels are available which is great. One mistake in your properties listing a few posts before is that property for channel name is still ListItem.Property(ChannelName) and not ListItem.Property(Channel) as written but ListItem.Property(ChannelName) works fine. In the first line i putted my lang alphabet, in the third line I put the image path that the helper produced. Its not encoding the path right. Thanks just checked and for me it is not working, at first I thought it was because you only added it for movie sets cast...so I changed that locally and tested but still no luck. I'll continue to have a look. I also spotted a unicode error for the critic consensus.